At Budget Blinds of Palm Bay, we're your local neighborhood experts that truly understand your needs. We're in your neighborhood, we know the local Palm Bay weather and community, and we’re backed by the #1 provider of blinds, shades, and drapes in North America. Over 25 years of customer satisfaction gives you peace of mind that only comes with choosing the proven leader. We bring the showroom to you in Palm Bay. We expertly measure your space, install beautiful window treatments, and back it up with the best warranty in the business so you can sit back and relax in the beautiful, Palm Bay weather and sunshine. We serve to give you the best in window treatments, so you can rest easy knowing your space will be beautified and optimized with window treatments that fit your individual needs. 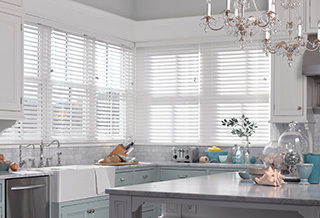 If you’ve been thinking about seeing your windows in a whole new light, then now is the time to partner with Budget Blinds serving Palm Bay. Our local, highly trained designers are backed by North America’s leading brand in stylish, expressive window fashions. From the latest styles in blinds and shades, to genuine wooden shutters and elegant drapery, your home’s décor can be transformed instantly when you partner with local, highly trained designers. So whether you’re near Grant, Micco, Melbourne Beach, or anywhere in-between, let our team of highly trained design consultants upgrade your home’s interior with expressive, stylish window fashions paired with the best warranty in the industry. At Budget Blinds serving Palm Bay we put our heart and soul into brightening up your windows and your Sunshine State lifestyle, and it all begins with our FREE in-home design consultation. The absolute best people to deal with. Great job! The house looks brand new! They have been wonderful. Eban and Dawn were great! From consultation to the final installation. They took their time ensuring our satisfaction. Great Job! – Tonia and Alex ..